With an 85-77 overtime win over Texas Tech, Virginia becomes the NCAA Men’s Basketball Champion. The win marks a year of redemption for the Cavaliers after last seasons embarrassing loss to the University of Maryland, Baltimore County (the first time a #1 seed lost to a #16 seed). After last season’s loss, the team received death threats, and according to UVA’s Kyle Guy, “It was humiliation, embarrassment for ourselves and our families and the program. To be able to redeem all that and get this program something that’s never happened before is all that I could ever want.” Monday’s final started off slowly, but then the teams came alive and battled it out forcing overtime where Virginia surged ahead for the win. Congrats to Virginia for winning their first national championship in school history. 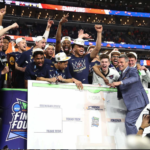 It was an exciting weekend of college basketball with Baylor beating Notre Dame to win its third NCAA women’s basketball championship under current coach Kim Mulkey. With the win, Mulkey joins UConn’s Geno Auriemma (with 11 wins) and Tennessee’s Pat Summitt (with 8 wins) to become the third head coach to win more than two national titles. Baylor 82, Notre Dame 81. Virginia will compete with Texas Tech Monday night at 9:20 pm for the National Championship. Neither team has ever won a National Championship, so Monday’s winner will make history. In other Auburn news, former head coach Tommy Tuberville tweeted he will be running for the US Senate in Alabama against Democratic Senator Doug Jones. Jones won a special election in 2017 and will be running for a full term next year. In the women’s bracket, watch Baylor vs Oregon at 7:00 pm and Notre Dame vs UConn at 9:00 pm, Friday, April 5th, with the winners playing for the championship on Sunday, April 7th at 6:00 pm. And, in the men’s bracket, watch Auburn vs Virginia at 6:09 pm and Texas Tech vs Michigan State at 8:49 pm on Saturday, April 6th. The winners will play for the National Championship on Monday, April 8th at 9:00 pm. After the Alliance of American Football disbanded this week, World Wrestling Entertainment (WWE) announced they would offer tryouts to AAF players for spots in wrestling. WWE chairman and CEO Vince McMahon intends to launch another alternative football league (XFL) in the spring of 2020, but the tryout offer was only for his wrestling company not for the XFL. The Women’s Final Four is set, and to no one’s surprise, UConn made the semis for the 20th time. In fact, UConn has been in the Final Four for the past 12 years in a row. Making their ninth trip to the semis, Notre Dame will face their rival UConn. UConn and Notre Dame have played each other 50 times with UConn leading 37-12. Notre Dame, however, holds bragging rights in Final Four wins at 4-3. The other matchup features Baylor (4th trip to the semis) taking on Oregon who is playing in the Final Four for the first time. In other NCAA news, Kentucky’s longtime coach John Calipari signed a contract extension to stay with the school for the remainder of his career. 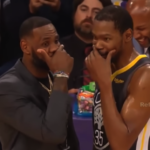 According to reports, UCLA was interested in speaking with Calipari for its head coaching position, but Kentucky offered a financial extension and a promise to “serve as an ambassador for the university after his retirement”. At $9.2 million, Calipari is listed as the highest-paid coach in the country. 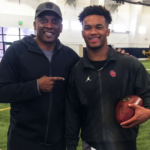 Top quarterback prospect for the NFL draft, Oklahoma’s Kyler Murray, had a workout and dinner with the Oakland Raiders on Monday, raising eyebrows on whether they would trade up from their 4th pick to take him. Their interest in Murray could also be part of a ploy to make sure other talent is available for their pick. Expect some interesting maneuvers in the next few weeks in anticipation of the April 25th NFL draft. 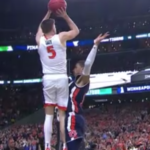 In other NCAA Final Four news, #5 Auburn overcame #2 Kentucky 77-71 in a thrilling overtime victory, clinching its first final four berth in school history. Rounding out the semis is Texas Tech and Virginia. On Saturday, April 6th In Minneapolis, Virginia will face Auburn at 6:09 pm EST and Michigan State vs Texas Tech at 8:49 pm. EST. Over the weekend in Prague, Indianapolis Colts quarterback Andrew Luck married his longtime girlfriend Nicole Pechanec. Luck and Pechanec were both elite athletes and classmates at Stanford University. Pechanec was captain of the gymnastics team and represented the Czech national team in the World Games and European Championships. Four teams so far are heading into the Elite Eight. Virginia is on a redemption tour after falling to a much lower seed last year and beat Oregon to advance and take on Purdue on Saturday. In other games, Texas Tech demolished Michigan, Purdue barely squeaked out an overtime win over Tennessee, and Brandon Clarke was the difference maker in Gonzaga’s win over Florida State. The rest of the Elite Eight teams decided on Friday. The Los Angeles Dodgers grabbed opening day headlines with their eight home runs (an Opening Day record) in a win over the Arizona Diamondbacks. In other opening day news, 30-year old Texas Ranger shortstop Elvis Andrus debuted his new walk-up song, and it’s a bit out of the ordinary. 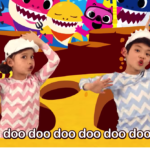 Andrus’ 20-month old son loves the song “Baby Shark, doo doo doo doo doo doo” and according to Andrus, “If you don’t like it, you better get used to it, it’s not going away. Hopefully ‘Baby Shark’ can hit well. … At least get me one hit a day, it’s going to stay.” So far the song seems to be working, as he hit two singles and a home run in a loss to the Chicago Cubs. 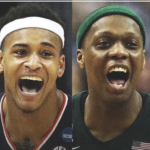 NCAA Sweet 16 rounds continue today and throughout the weekend. For a ranking of the most exciting of the 8 games to watch, click here. One of the most watched games will feature top-seeded Duke battling it out with Virginia Tech Friday night in Washington D.C. Unfortunately for the team, however, one of their top scorers, Ty Outlaw, has been charged with possession of marijuana, and his status for the remainder of the tournament is uncertain. Outlaw is Virginia Tech’s best 3-point shooter and averages 8.7 points and 5.4 rebounds. 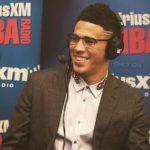 In the NBA, Devin Booker became the first Phoenix Suns player to record consecutive 50-point games. Booker is one of only 10 players in the League to have consecutive 50-point games and is in great company as the other nine are: Wilt Chamberlain, Michael Jordan, Kobe Bryant, Allen Iverson, James Harden, Elgin Baylor, Rick Barry, Bernard King, and Antawn Jamison. It’s opening day for Major League Baseball! For predictions on the season, click here. 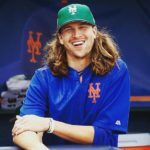 The New York Mets signed reigning National League Cy Young Award Jacob DeGrom to a contract extension for five years, $137.5 million. According to Mets COO Jeff Wilpon, “This is a tremendous day for Jacob, his family, our fans and the entire Mets organization. 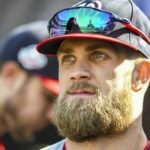 Mets fans can celebrate knowing their ace will remain in Flushing.” The season begins on Thursday against the Washington Nationals.